As our regular readers know, we frequently pose a series of questions to a winemaker to probe their winemaking philosophy and to gain insight into how they became a winemaker. 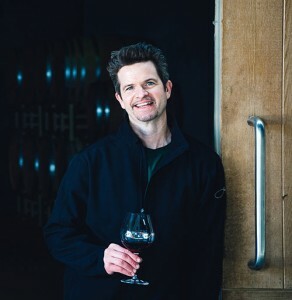 This week, we are featuring Jonathan Nagy, the winemaker at Byron Winery. Founded in 1984, Byron Winery is a part of the Jackson Family Wines Collection. Byron is located in Santa Barbara County, California. Jonathan was raised there, in Santa Barbara County. His first job in the wine industry was at Robert Mondavi. Jonathan was then a senior in college finishing up his chemistry degree. He decided to work a second harvest at Mondavi, and before long, he was back in the industry at Cambria Winery. Jonathan joined Byron Winery as an assistant winemaker in 2001, and has been its winemaker since 2004. Born in Marietta, Georgia. Raised in Santa Maria, CA, and Campbell, CA. I was living with a Danish family one summer while going to junior college. They had wine almost every night with dinner. The exposure to different wines from different regions really turned on the light bulb that wine was pretty cool. In 1996, I was a Senior at UCD studying towards a Chemistry degree, and I had one class to take in the Spring. I applied for lab jobs in the wine industry mostly because they would lay me off right around when ski season started. I was hired at Robert Mondavi in Oakville then went to live in Aspen, Colorado for the winter. I ended up working another harvest at Mondavi then moved to the central coast with the intention to go to Cal Poly to get my teaching credentials. I took a part-time tasting room job at Cambria Winery. When the winemaker realized I had a Chemistry degree and two harvests of experience in Napa, he offered me a full time job in the Cambria lab for harvest 1998. I figured I could always go back to school if I didn’t like it. One day, I was stirring barrels and realized how much fun I was having (while getting paid), and I decided to pursue a career in winemaking. I was promoted to Enologist in 1999, and I supervised the night crew during harvest. In 2001, Ken Brown hired me as the Byron Assistant Winemaker. I was able to work closely with Ken until he “retired” in 2004. I’ve been the Byron winemaker ever since. In your view, what makes your vineyards special? Santa Maria Valley is one of only two East-West oriented valleys located on the West Coast. The straight shot to the ocean means the maritime influences really define our region and its’ vineyards. The daily breezes off the coast and fog keep things very cool during the Spring and Summer. Santa Maria Valley is pretty far South in relation to other premier Chardonnay and Pinot Noir regions. If we didn’t have the East-West valley, it would probably be too warm for Pinot Noir and Chardonnay. Because we are so far South, our mild winters leads to a very early budbreak. The early budbreak means a longer growing season, which lets the grapes develop intense flavors with more hang time on the vine. We have very sandy soils in Santa Maria Valley (with outcropping of shale and limestone). This really impacts skin development and subsequent flavors. I believe it is why our SMV Pinots always have a silky tannin profile and textures. The other East-West Valley is the Santa Ynez valley which is directly South of the Santa Maria Valley. The mouth of the valley is the Santa Rita Hills AVA. Because of the orientation and location much of the growing is similar to Santa Maria Valley. The big difference is the soils. Santa Rita Hills has more calcareous, diatomaceous soils with pockets of clay and loam. In general, this means thicker skins and unique flavor development. The wines from this region tend to have darker fruit expressions with big, chalky tannin profiles. We work with some amazing vineyards. The goal is always to express each unique site by taking the best of old world methods and ideologies and applying them to the best of new world methods and ideologies. Which changes from vineyard to vineyard and season to season. I think I’ll stick local. I’ve always been a fan of and have looked up to Billie Wathen at Foxen and Adam Tomack at Ojai. Gigual’s La Turque and La Landonne were stunning. Also, Christophe Roumier’s 2002 Bonnes-Mares Grand Cru was amazing. 1992 Taylor’s Vintage Port. The same. C. Nagy Rose of Pinot Noir (my wife’s wine brand). Gran Moraine Chardonnay and Bethel Heights Pinot Noir. Both Oregon. Outdoors with family or reading a good book. That I’m not that surprising? Teaching high school math, physics, or chemistry and coaching high school basketball. Aiming for perfection which is never attainable and usually results in excellence.